Sometimes life happens and you can't attend worship in person. Whether it is illness, a business trip, or just a bump in the road, we want you to stay connected. Watch the full service each Sunday through our YouTube channel, beginning at 10:30 am. Below is a list of current (and upcoming) sermons. 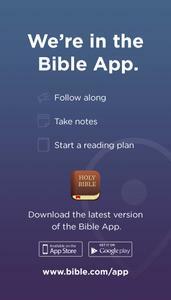 Follow along each Sunday using the YouVersion Bible app (free). 1) You pray like Jesus. 2) You discover the heart of God. 3) You can be transformed. Ever wondered why people around us aren’t interested in God? Maybe we’ve never given them a reason to be. However, if we’re real with people they will be real with us. We can make Jesus relevant and real in the lives of others, not by arguing them into the kingdom, but by showing them what a Christ-follower looks like— someone who engages with the community, who thoughtfully inquires about sensitive, ultimate issues, and who encourages others by our loving presence. There is an art to loving your neighbor as yourself. A new year means new beginnings. As we enter 2019 it is important to remember who we are and where God has called us to go. We have discerned three goals for our upcoming journey together. So whether you are new to First Covenant or just new to these goals, let’s all walk the path forward together. Let’s engage in God’s work among God’s people. During the first two weeks of the year we celebrate Epiphany (“appearing”) and the baptism of Jesus. By appearing and entering human existence we not only see the glory of God - they mystery revealed. We may be drawn into that mystery and experience God’s glory revealed. Miss a week? Want to hear something again? Looking to share a good word with a friend? Listen here or go to our YouTube page for videos. The bulletin includes details on events, activities, and updates about official ministries of First Covenant Church.